Competition grows as the globalisation of markets accelerates. A stronger customer orientation as well as an increasing demand for complete solutions, especially individualised offer bundles are strong drivers of the growth of the service sector. Digitalisation as well as technological innovation is driver for completely new types of business models. Young start-ups are growing, evolving new markets and industries, leaving traditional businesses breathless in trying to keep up with innovation processes. Bigger corporations extend their product offerings with complementary services or product-service combinations. But smaller businesses still struggle with innovation due to lack of resources, knowledge and capacity to change their business models. As a group of service design and marketing specialists we set up a cross-disciplinary research project in order to investigate into new ways of forming innovative business models for small and medium sized enterprises. The priority goal of this project is to define the means of supporting small and medium sized businesses to go through the process of building a business mash-up. 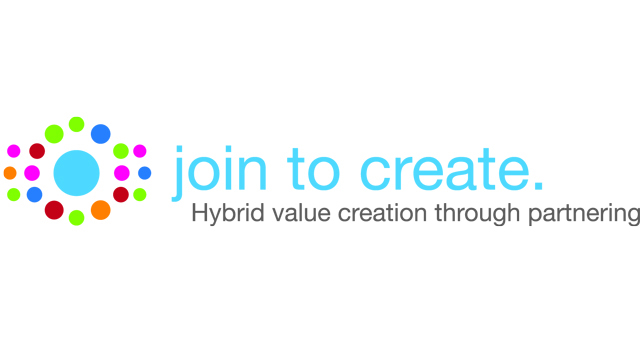 The term “hybrid value creation through partnering“ describes a business mash-up with the purpose of combining products and services in one innovative and problem-solving customer offering. 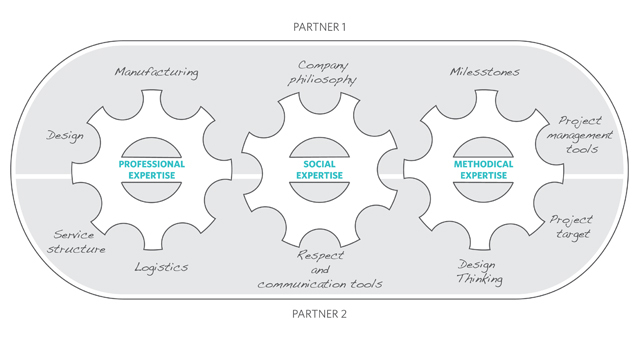 The offering is build out of the combination of the unique competencies of each partner and creates a higher value than its individual parts. Hybridisation is a principal of evolution. Mash-ups make businesses more flexible, more able to adapt to market changes, more versatile in their portfolios and reach out to new customer segments. Especially for small and medium sized enterprises (SME) collaboration with a partner is a strategic opportunity to increase their scope. With the focus on how SME can engage in innovative business mash-ups the research project ”Join to create – hybrid value creation through partnering“ was started in 2011 by sedes research, the Center for Service Design Research under the lead of Professor Birgit Mager and Science Marketing, the Science-to-Business Research Center lead by Professor Dr. Thomas Baaken at the University of Applied Sciences Münster. The project is funded by the European Union and the county of North Rhine-Westphalia, in close affiliation with 15 small and medium sized enterprises from the North Rhine-Westphalia region. The starting point of the research project was the objective to use service design methodology to support and facilitate regional SME to do business mash-ups. The main focus of our research was to find out how SMB’s do partnering and why they don’t do business mash-ups. The project was divided in several stages of exploration, creation and validation. During the exploration phase our partner companies have been analysed upon their business partnerships and collaboration activities. On the basis of this analysis and preliminary desk research a catalogue of hypotheses was developed. 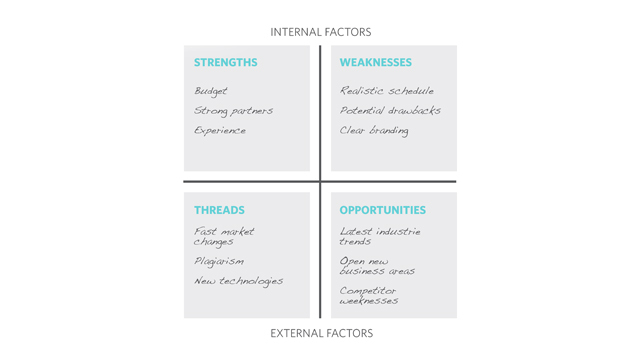 The hypotheses discuss the drivers and barriers of collaborations with a business model based on hybrid value creation. For example is the use of a specially fitted communication in collaboration of two or more companies a strong driver for their success, whilst bureaucracy often hinders convergent work streams. One finding of this preliminary research showed that SME do have various partnerships in their value chain. Yet many smaller companies are troubled by the lack of resources and experience to engage into new partnerships especially from other branches. They rarely find partners outside their already existing networks, through personal relationships and often depend on something several of the interviewees called the “nose factor”. The biggest need of SMB’s is in strategic and methodical support in this process of building new and innovative partnerships. Many companies are familiar with a great variety of tools; yet find it difficult to make effective usage of them on a regular basis. Business experts stated that the effort to get to know and actually start using tools in an effective way, however useful, often exceeds the benefit for smaller businesses, especially those unfamiliar to design thinking processes. For a busy small enterprise in order to engage with a new methodology the clear benefit has to be evident. After the synthesis of the exploration phase the research objective was to develop a guideline and toolset for business mash-ups addressing small and medium sized enterprises. In a quantitative study tools and methods from the fields of business management and design thinking that companies of all sizes use in partnership processes were collected and evaluated upon their use and benefit in everyday work life. 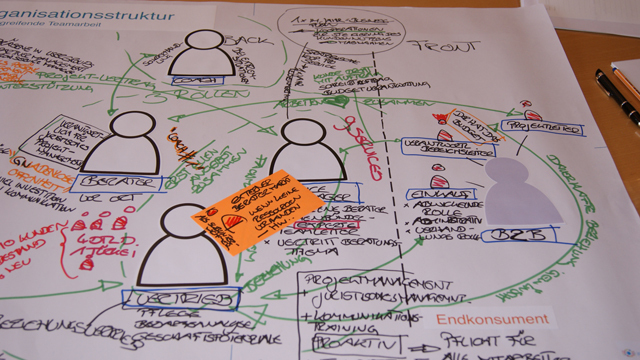 They have then been visually illustrated and put together in an easy to understand process guideline. 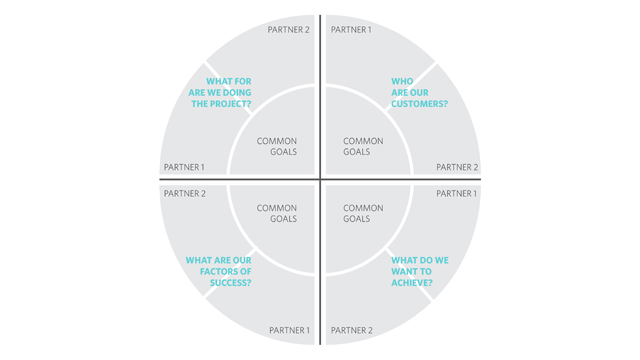 The guideline illustrates the whole process of hybrid value creation through partnering. It describes each phase in an easy understandable way including action plans, possible barriers and methodology to overcome. Furthermore it provides a practical toolbox. 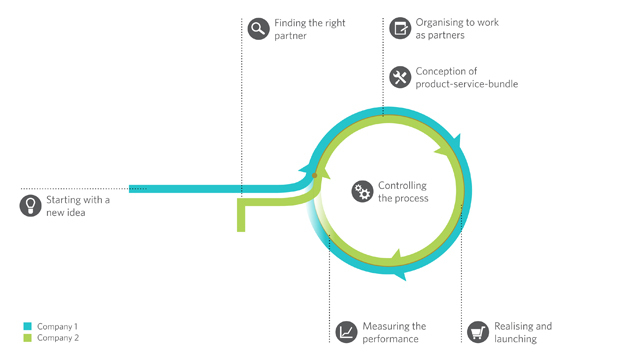 Through flexible checklists the most important things to think of in each phase are presented: for example how to look for strategic partners, partner evaluation methods and scoring models, partnership contracts and such more. The tools include simplified templates and explanations from ready to use such as empathy tools, brainstorms, customer journey maps, project target maps and ideation games specialised on the needs and requirements of business mash-ups. The guide and toolbox are supposed to be used by any business partners and adapted to their individual needs. 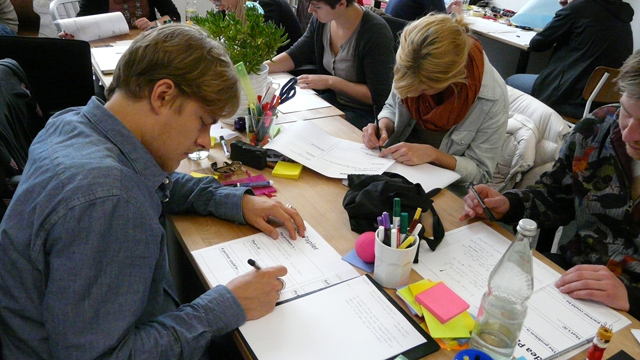 Service design helps to identify opportunities in B2B relationships, as service designers support companies in various processes cross-industries. 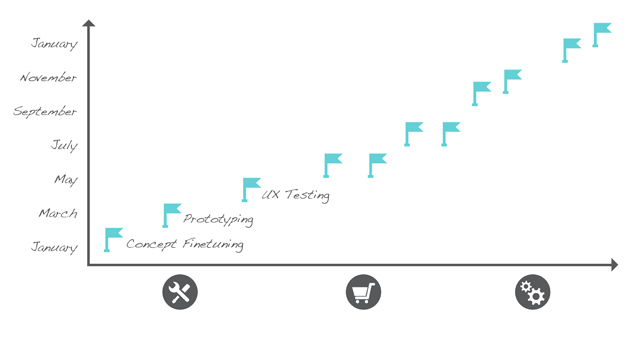 The use of design thinking methodology and strategies helps revealing the needs of different stakeholders and the co-creative approach increases the acceptance of change towards innovative business models. In the beginning of December we are evaluating the guideline and tools with our partner companies. Also we will complete the website with the downloadable templates. 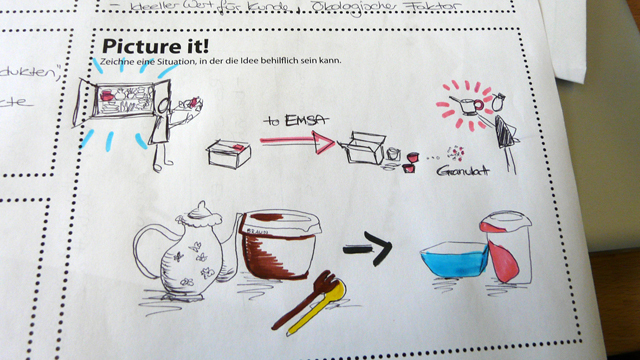 The results of the research project have been presented at the Global Service Design Network Conference 2013 in Cardiff and the Service Design & Tourism Conference 2013 in Sarasota, Florida.